Most people don’t get excited at the mention of a root canal, but the fact that it can save your tooth and help prevent extensive dental work down the road is something to feel good about. At Mint Dental in Edgewater, New Jersey, Young Kim, DDS, specializes in cosmetic and restorative dentistry, and makes root canals as painless as possible. Patients of all ages in Edgewater and the surrounding communities trust Dr. Kim’s 20 years of experience and her compassionate, patient-centered approach to root canal therapy. For expert care, call to schedule an appointment or use the online booking system. A root canal is a treatment to repair a badly decayed or infected tooth. During a root canal, Dr. Kim preserves your tooth by removing the infection from the tooth’s root so you don’t lose the tooth. With today’s technology, root canals are no longer a painful dental procedure. Instead, root canal therapy relieves the pain associated with a decaying or damaged tooth so you can feel better faster. A root canal is the treatment of choice for teeth that might otherwise die from the infection and need to be removed. It can help you avoid more costly dental work in the future. The pulp is the soft core of a tooth that extends from the crown — the visible part of your tooth — into the root below your jawbone. If a tooth becomes cracked or decayed with a deep cavity, bacteria can spread from the crown into the nerves and blood vessels in the tooth’s pulp. When this happens, the pulp often becomes infected and causes intense pain. If left untreated, the infection can cause an abscess with swelling in your face, neck, or gums. Decay or trauma can damage a tooth enough to require a root canal to save the tooth and relieve your symptoms. 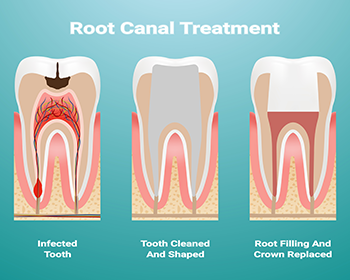 A root canal may involve one or more dental appointments depending on the severity of your infection or damage to the tooth. Dr. Kim makes your comfort a priority during your treatment and numbs your mouth before beginning to clean the tooth. She places a rubber dental dam over the tooth to keep it dry during treatment. Dr. Kim makes an opening in the crown of your tooth and uses a series of files and a rotary instrument to remove the pulp, nerve tissue, and bacteria from inside the tooth’s root. After Dr. Kim removes all signs of decay and infection, she cleans the tooth and seals it with a permanent or temporary filling. At your follow-up appointment, Dr. Kim places a custom-made crown over the tooth to protect it from further decay. To learn more about preserving your tooth with a root canal, call or click online to schedule an appointment.